I'm sure you've seen the advertisements for the new Motorola Droid phones. The makers of the phone have gone through a lot of effort to make the phone appear alive and intelligent. One of the things they do is place a pulsating eye on the phone on start up with a voice that says "Droid". The phone gives you feedback everytime you receive a text message or e-mail. When you click on an icon to start an app, the icon's background is highlighted to let you know it received your touch. When you click on the buttons at the bottom of the phone, there is a slight vibration that does the same. So how do you make something appear alive? If you research characteristics of living things you find a variety of answers that all roughly explain the same attributes like reproduction, growth, energy usage, and being responsive to the environment. This post will focus on how you can make your training feel more alive by making the training environment more responsive to the learner. 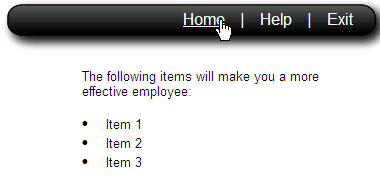 Of course, well designed training will always trump usability. Never the less, usability is extremely important and there are things that can be done to make your learners feel more comfortable with your content. My mantra has always been "less is more" and most of the time that has been a very effective strategy when it comes to usability. Be judicial as you use these tips to improve the experience your learner has with your content. Transitions can make your content feel alive and responsive instead of just another slide in a predestined slideshow. I use the fade in or fade out transitions a lot. Fly ins are also a common transition that can be visually appealing. 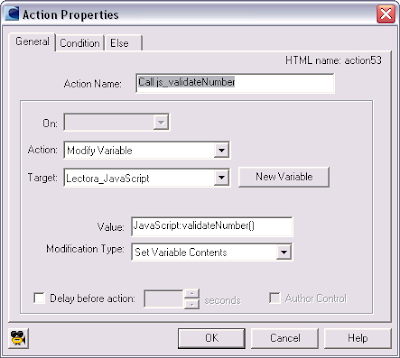 Many popular authoring tools like Lectora and Captivate provide good transitioning options. One caveat, remember that when implemented poorly, transitions can be more distracting than helpful. What does that image in the upper right corner mean? What happens if I hover over it? Put in content that rewards your learners for being curious and encourages them to discover everything on the page. Use hover and click events to revel bonus learning material that may not be necessary for the course objectives but is a nice enrichment of the material. Learners that want to go beyond the existing material will have the opportunity through exploration of content on the page. These learners will become your biggest evangelists as they learn to appreciate the enrichment opportunities "hidden" in the content. Always give your user feedback. This includes feedback on where they are in the content, feedback on the completion status of sections, corrective feedback when they have not fully completed an activity or a section, and for goodness sake, remedial feedback when they miss a question or perform incorrectly in a simulation. E-Learning without feedback is truly in the non-living category! We all know that attitudes toward training vary greatly in the workplace. Some people seize every professional development opportunity possible and are always eager to learn something new. Many are less enthusiastic. Of course, we also know that if people don't feel confident in their ability to master the training content, a common reaction is to be resistant to the training. Clearly, we should do something to overcome these gripes and motivate people to learn. 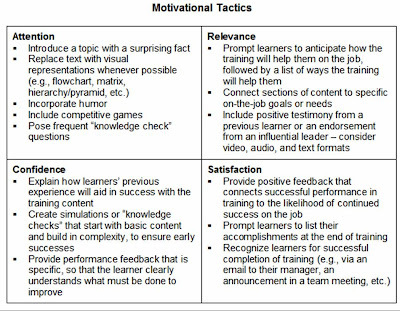 But how do you motivate people to learn? John Keller answers this question in several articles he has written about his ARCS model. ARCS is an acronym that represents four components of motivation in training: attention, relevance, confidence, and satisfaction. Each of these components is briefly defined below. So now what? 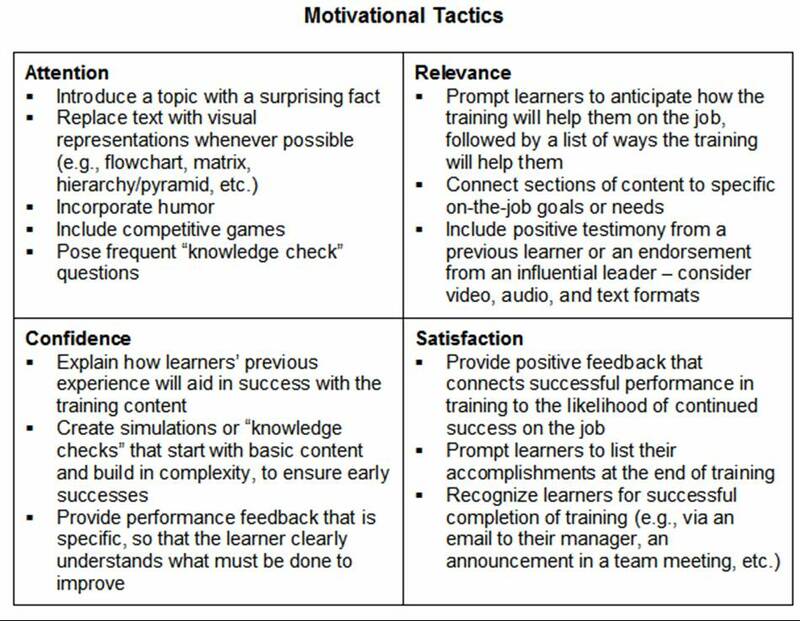 How can these motivators be designed into an eLearning module? Fortunately, some of these things are simple touches that can easily be worked into the training. Below are a few techniques I've seen in my organization. You can click on the table below to enlarge it. After I've storyboarded an eLearning module, I'll often go back through to identify places where I could work in something motivational. Considering how effective these basic motivational tactics can be, the extra step seems to be time well spent. Most web developers use CSS to specify how they want each web page element to look on their web site. They can control things like text color, font, margins, and all sorts of other attributes of elements. For example they may want all paragraphs to have a 10 pixel margin. This is done using CSS. Hyperlinks by default are underlined and blue. While this is a standard and is universally recognized, there are times in which blue underline does not look appropriate in your project. Using CSS you can change this. If you are familiar with CSS you'll know to include a style sheet in your web page or use the <style> element in the header of your page. So how do you do this in your e-learning using Lectora? I've set up a page with a top navigation bar that contains three links to the home page, the help page, and to exit the project. After adding the hyperlinks, I removed the underline and changed the text color to white. Now you are ready to add the CSS to show an underline when the user hovers over the links. 1. 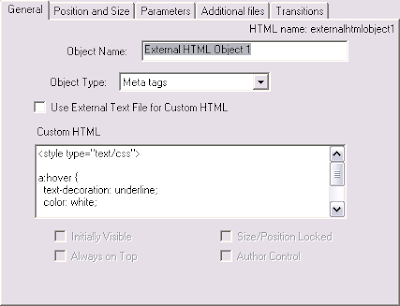 Add an External HTML object to the page. 2. Give it an object type of Meta tags. This will place the CSS code in the header of the underlying HTML page. That's it. Now when you preview the project in HTML, you'll see the underlines appear when you hover over the hyperlinks. 1. Create a variable that will contain an answer to the question "Is this a number?" Open up the Variable Manager from the Tools menu. Stay with me. This is getting slightly illogical so if you like your Lectora code always in perfect harmony then your eye may be starting to twitch right about now. You will see why you are doing this in the next step. Add the following action to the Calculate Months action group you created in the Math the Lectora Way post. Put it in the first spot so that it is called first. 4. Make decisions based on the answer to the question "Is this a number?" 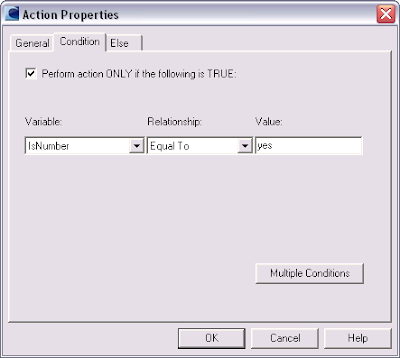 Check the box next to "Perform action ONLY if the following is TRUE." 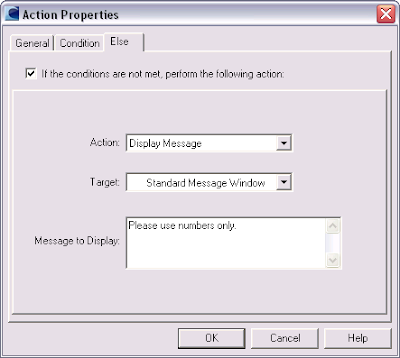 Check the box next to "If the conditions are not met, perform the following action." Message to Display: Please use numbers only. 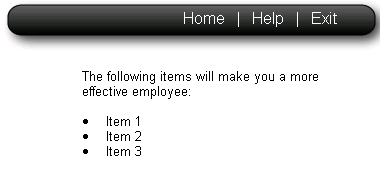 If the value you enter is not a number, the you will see the pop-up message "Please use numbers only." If the value you enter is a number, you see it calculated as before in the Math the Lectora Way post. For this example, we'll calculate the total number of months in a specified number of years. Add a text box. The text box can sometimes be hard to find. Go to Add >> Object >> Form Object >> Entry Field. Name the textbox "Years". Name the associated variable "Years" also. Add a button. Label the button "Calculate Months". Add a label. This is where we will but the results. Name it "Months". You'll be adding two actions to the action group. The first action will calculate the months. The second action will update the page with the new value. You will need to make sure these are ordered as stated to display the correct results. All that is left to do is to see the code in action. Preview the project and notice any number you put in will be calculated into months when you click the button. What happens if you don't put in a number? The calculation will not work and the text will show up in the results. 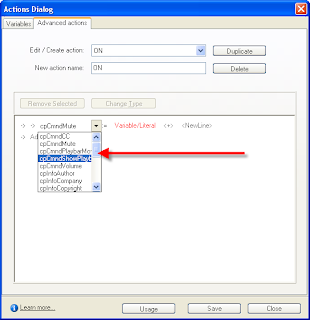 One of the new features of Captivate 4 is the ability to access and use system variables. I recently was able to explore how these might be used to turn on and off the navigation bar within the skin of my Captivate lesson. Many designers include assessments within their Captivate lessons. During the informational and practice portions of the lesson, the students can use the navigation bar included with the Captivate skin to proceed through the lesson. However, when they reach the assessment, it's often desirable to disable navigation back to the course content so that the assessment is a true test of what the student can recall. Upon arriving on the scoring and results page, the navigation bar would be turned back on and the student would be able to review the lesson and retake the assessment if necessary. 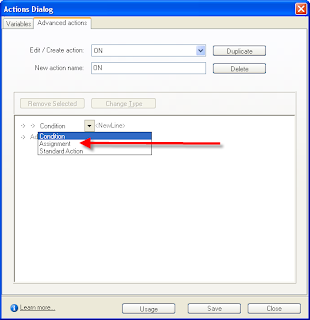 First you need to set up Advanced Actions to turn on and off the navigation bar. 1. Select Project > Actions from the menu and click the Advanced Actions tab. 3. 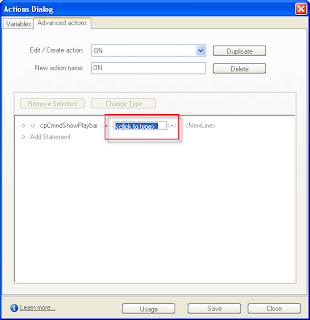 Enter a simple and descriptive name for the action. 5. 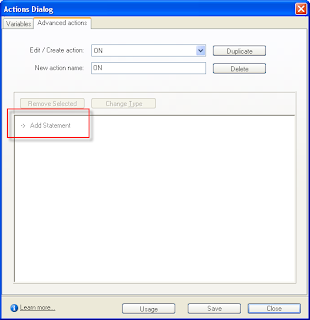 Double click on the "Add Statement" text that now appears and double-click again to see a drop-down list. 6. Select Assignment. 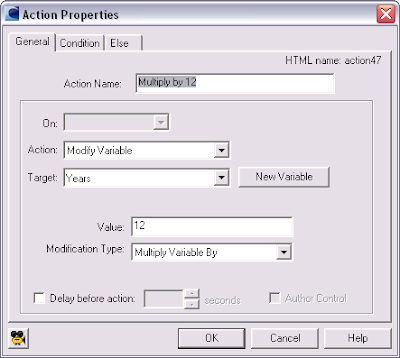 Result: the system variables will replace the current drop-down options. 7. Select cpCmndShowPlaybar. The variable will display now with an equal sign to the right of it. 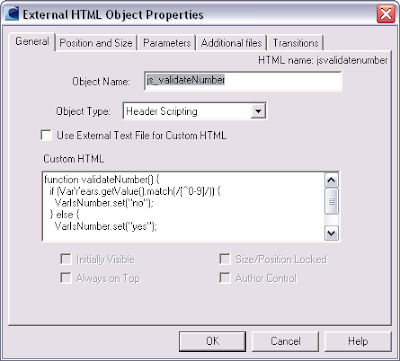 To the right of the equal sign, a drop-down appears with the options of Variable or Value. 8. 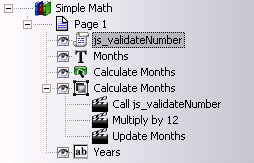 Select Value. A text entry prompt will appear. 11. 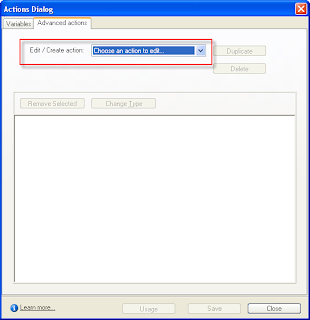 Repeat the steps above to create an action to turn the navigation bar off. Now, here is how we used these actions within the Captivate lesson itself. 2. Select Slide> Properties from the menu. 3. 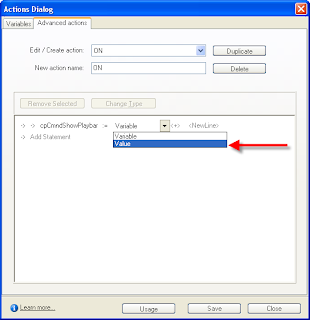 Change the "On slide enter" value to "Execute advanced action." A second drop-down will appear with the actions you set up. 4. Select the action to turn the navigation bar off. 5. 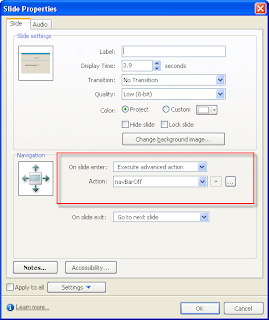 Select the slide where you would like to turn the navigation bar back on and repeat steps 2 and 3, this time selecting the action to turn the navigation bar on. Test your results! NOTE: I have not tested all different publishing options with this setting, so it may help you to know that I published this to Flash Player 9 and ActionScript 3. Do you know the reasoning behind why the world-wide web was created? (Hint: it was not to exchange music and books for credit card information) It was created to help people share information. Actually it was created for physicists across the world to share information in an easy to read format. They shared this information through documents connected together through hyperlinks. It's not that far of a stretch to say it was created to be the ultimate e-Learning tool. As the web transformed over time people discovered that the ability to collaborate on projects over the web made it an even more powerful tool for sharing information. The ability to collaboratively work on documents, to share web services, and use software on the web instead of installing it on your computer is what many people refer to as web 2.0. Web 2.0 has opened many doors for new businesses, as well as, new e-Learning opportunities. Wikipedia has a write up on Web 2.0 where you can get some background on Darcy DiNucci's mention of the term "web 2.0" in 1999, followed by Tim O'Reilly in 2004, and then the 2006 Time magazine article Person of the Year - "You". You may even want to check out the original web 2.0 wikipedia entry first written in February of 2005 to get a better appreciation of how this terminology has morphed (somewhat) over time. Christopher Barnatt explains web 2.0 in a clear way that helps to define what Web 2.0 means versus the hyperlink focused Web as it emerged in the 1990's. Take a look at the following video. The ideas that make up Web 2.0 are social networking, web mashups, and using the web to store and create content. 1. Social networking is a crazy buzz word right now. "Follow me on Twitter" has become a popular fad for people to market themselves. Twitter, a micro-blogging and status update technology, is one of among many ways that web users are using social technology to share information. I think of popular web based social networking technologies as breaking down into three categories. Object centric networks like Flickr and YouTube use content as the impetus of social networking. Ego centric networks like Facebook, Linked In, Blogs, and Twitter use human instigated actions as the impetus for social networking. And finally, knowledge centric networks like Wikipedia and other wikis use information as an impetus for social networking. 2. A web mashup is the second concept in what makes up Web 2.0. Web mashups make sharing information easier by allowing web technologies to comunicate with each other through web services and other technologies. A web user may see one page of information but it can come from more than one web technology or provider. One example of this is Woozer which combines Google Maps and Weather.com technologies to give 10 day forecasts from all over the world. The Twitter API has been used over and over to create a plethora of cool little Twitter based apps. Many mashups are done to combine air, hotel, and other reservation technologies to provide travel services in a one shop location. Another simple way to mashup web information would be to embed objects like YouTube videos, SlideShare demonstrations, and Google Calendar into your web page. iGoogle does a good job of this type of mashup by aggregation. 3. Using the web to create, edit, and store information is a relatively new concept. While the idea has been around for a while, it is only recently that speed, reliaility, and consistency among web standards have made this practical. However, even today you'll here people still complaining about the errors or slow response times of web applications. One of the most popular web applications now-a-days is Google Docs. Google Docs allows people with Google accounts to create and edit common office documents like word documents and spreadsheets. 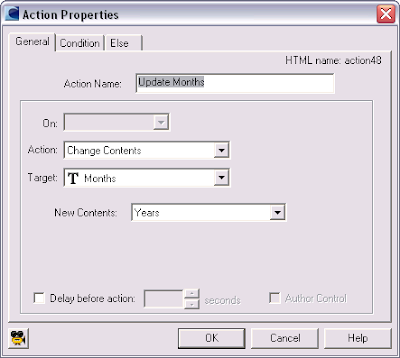 With the release of Microsoft Office 2010 (See Office Web Apps), you'll have similar functionality from a Microsoft product. With these applications, not only do you have the ability to do all your work online (no software to install), you can also collaborate with people so that more than one person can view and edit the document you are working on. This type of social collaboration really solidifies this as a web 2.0 product. Another good example of a software service is the online mind mapping (or brainstorming) software by Mindomo. Mindomo does not have the collaborative authoring component but there are similar products that do. So what is the impact Web 2.0 has on e-Learning? Web 2.0, as I've described it here, is one more tool that can be applied to create a better quality training environment. It does not replace any one particular technology. Each technology has it's strengths and weaknesses. For example, if you followed some of my links to Wikipedia, you probably noticed some of its weaknesses. The articles written are targeted towards a broad audience and some of them are not even written well for a broad audience. Work place training is always most effective when it is targeted to a specific audience and attached to specific performance goals. From that perspective collaborative knowledge tools like wikis, while great for collecting ad hoc information, will not replace a well designed and performance targeted self-paced web course. However, Web 2.0 technologies are "living" technologies that are constantly updated and can provide a quick way to get information updated. I hope I've been able to help build your definition of what Web 2.0 is. What did I leave out? What is your perspective? How are you using it in your training?